It is now a legal requirement to have any air conditioning system containing 3 Kg or more of refrigerant gas checked annually for leaks, ACS can offer the service, please contact us for further details. Under the Montreal Protocol, Ozone Depleting Substances such as Refrigerant gases have been strictly regulated. CFC gases (e.g.R11, R12, R113, R114 & R115) have been banned completely since 2000, and the use of HCFC gases such as R22 in new heat pump systems was banned from 2004. Under the Kyoto Protocol greenhouse gases are also now strictly regulated, of which HFCs are one of the six identified categories. (HFCs are the current replacement for CFC and HCFC gases being phased out under the above Montreal Protocol). Under European Union Regulation 842/2006, all systems containing 3Kg or more of refrigerant gas must have an annual leak check, we do this during a service visit. 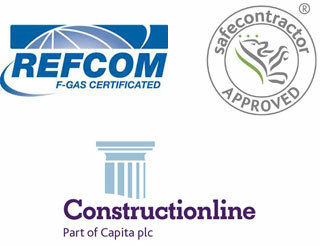 It is now an offence for any named persons to vent or handle refrigeration without an F Gas certificate both contractor and client are liable and can be fined up to £20,000 or five years imprisonment, please check your contractor has up to date certification, our staff have F Gas certification and also we as a company are registered with Refcom. It is therefore important that your Air Conditioning systems are well maintained and serviced, and it is also important for you to verify which gases you have in your systems to know if they are serviceable and to budget for future replacements. As of the 1st of January 2015 we cannot break the refrigerant cycle on R22 gas units, this means NOT being able to re-charge units or change compressors, we can carry out some other repairs and service working units. If you are not sure please inquire.